Working of the RGB LED is simple, we have created three Sliders, using Blynk app, for controlling the intensity of three colors of RGB LED that is RED, GREEN and BLUE. And one button for Flashing the RGB LED in different pattern, according to Program code. First we need to download and install Blynk Library for Arduino. We have included all the needed libraries to run this code in Arduino IDE, and then entered Auth Token, from the Blynk app, in the auth string. Here we are connecting Wi-Fi serial pin with Software Serial of Arduino. Selected pin 2 as RX and 3 as TX. After this, in setup function we initialize all the required devices, begin serial communication, providing Wi-Fi username and password. Then we have checked condition for Button (Virtual Pin 1). Here we have selected virtual pin 1 (V1) for taking input from Blynk App to flash the RGB LED. Here we should note that, we have attached two codes in our Code section below, first one is just for controlling the intensity of three colors in RGB LED without flashing it and second one is for flashing the LED as well as controlling the three colors of RGB LED. We only need to define RGB Led pins in second program, i.e. 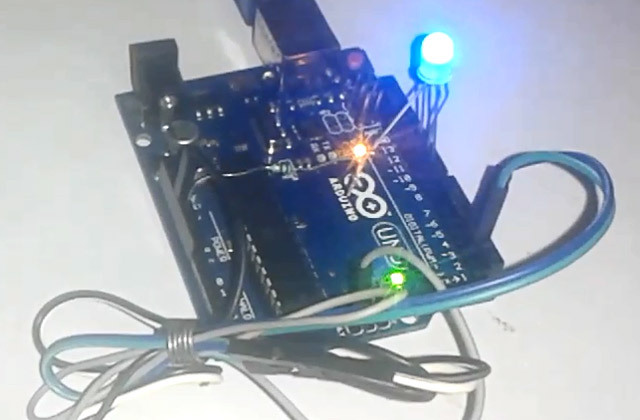 Flashing LED program, because Flashing of LED is controlled by Arduino. On the other hand in first program, Colors of LED is controlled by Blynk app in Android phone, so we don’t need to define RGB LED pins. We can say that if we only want to change the color by Sliders and don’t want to use Button for flasher then we don’t need to define of RGB pins. The given function is for flashing the RGB LED when button is pressed from the Blynk App. Note: Two Codes have been given below. One is for just changing the colors of RGB LED without flasher and second one is for changing the colors with Flasher. Check the Video for more clarity. Install the Blynk Library first, there are lot of tutorials over internet. may be problem in your connection or baud rate mismatch? suddenly blynk connected to arduino , and suddenly display arduino not in range, or arduino get disconnected? Can i use a 9v battery powersource for this? Which wifi module are you using? And there are two programs in Code section, In which program you are getting error? i really appreciate your work. i am new to this and have problem connecting esp8266 and blynk. In serial monitor i face to failed to disable echo error. how can i solve it?. Any need to flash esp? if yes how?